San Luis Obispo County Sheriff deputies have increased the number of alleged drug smugglers they have in custody from Thursday’s investigation to 20. 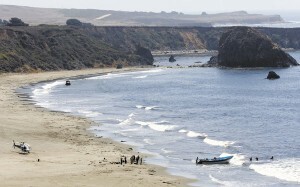 Following up on in a tip of a panga boat off the coast of San Simeon, a California Highway Patrol officer flying over the coastline in a helicopter spotted the vessel loaded with large bales of marijuana near San Carpoforo Creek Road. Investigators confiscated 43 bales of marijuana ranging in size from 70 to 90 pounds each for a total of more than three thousand pounds. It’s estimated to have a street value of more than 4.5 million dollars. The sheriff’s department turned the case over to the federal government and the Department of Homeland Security. The 20 suspects will be transferred from San Luis Obispo County Jail to the Metropolitan Detention Center in Los Angles on Friday.